Daboecia are related to the Ericas and can best regarded as a heath. 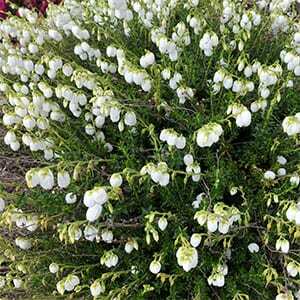 They are low growing shrubs, very useful a ground cover plants. 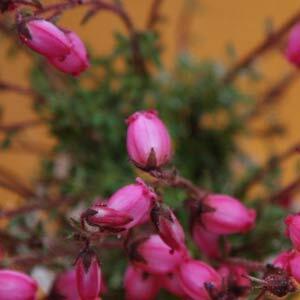 With only two in the species Daboecia azorica with its wonderful pink flowers and Daboecia cantabrica, which is St Daboec’s Heath, flowers appear in late summer. These species will grow to nearly 1m, but usually 600cm or less. Try a part shade to sunny position in a humus rich soil. Deep green foliage through the year makes a great plant, and when in full flower it is even better. A humus rich well drained soil which retains some moisture is best. Some gardeners like to dig in some coir peat before planting. Flowering from late summer through to winter they add useful colour to the garden. They take well to pruning and are easy to keep neat and tidy. Best is a slightly acidic soil that hold some moisture, you could grow them in a sunny position near Camellias where they will add extra colour at a lower level. Species include: D. cantabrica and D. azorica. Cultivars include D. cantabrica atropurpurea and D. cantabrica ‘William Buchanan’ with mid to deep pink flowers.